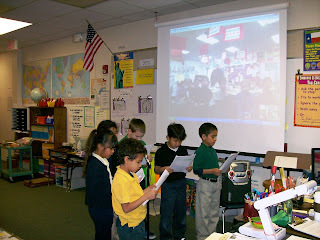 My students sharing an excerpt from MLK's "I Have a Dream " speech while the other class watches and listens via Skype. What a fun day we had Skyping with a 3rd grade class in suburban Chicago. My students read their reader's theater excerpt from Dr. Martin Luther King's "I Have a Dream" speech and the other class shared some of their writing. Afterwards, the students asked each other questions. We learned that a Chicago Dog has a bunch of stuff most second graders don't like and that deep dish pizza sounds really good. My students shared their favorite sports teams and their ancestral heritage. During the call we also discovered that both classes have blogs so we made a plan to read and comment on each others' blogs! My students really enjoyed the experience and asked if we could do it again! What a wonderful way to share experiences and work. Well done to all the students and a very resourceful teacher. Congratulations. I'm sure your students are now hooked. I love the idea of sharing a Reader's Theater! Nice job. Our class loves to participate in the Mystery State Skype - if you'd like to try it let me know! Nancy I would love to do a mystery skype. I am mrsmorgansclass on Skype. It sounds like you had an amzing time skyping with another class.What a great way of getting to know about other people's lives. It's great that you really enjoyed the experience.